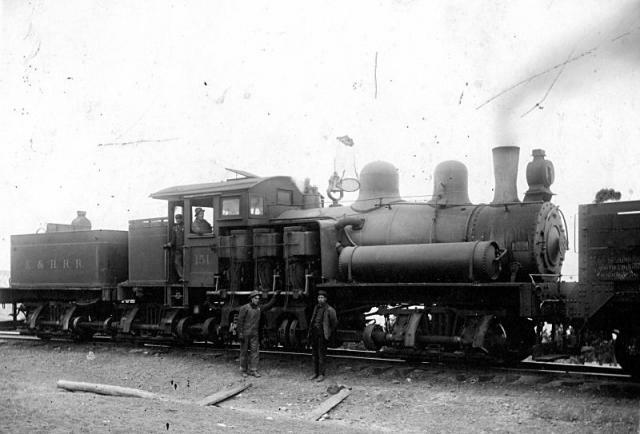 Built 12/06/1902 - 36" gauge - (2) 6" x 10" cylinders - 22" drivers - 10 tons - 2 trucks - named "Kalbach"
Note the two outward positioned cylinder steam chests with the single cover plate for both. 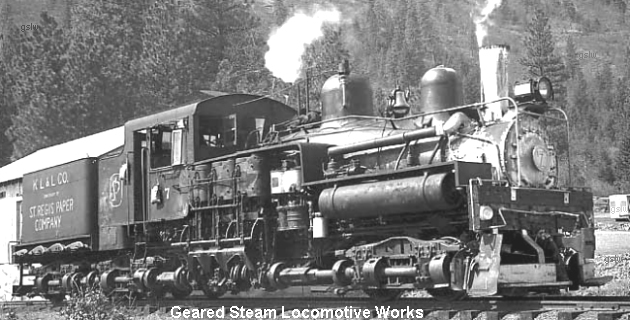 Unlike the Willamette locomotives whose cylinders were positioned outward, very few Shays employed this design. Photo posting permission was granted by the Allen County Historical Society courtesy of Dan Rowe. Dan also supplied all the information. 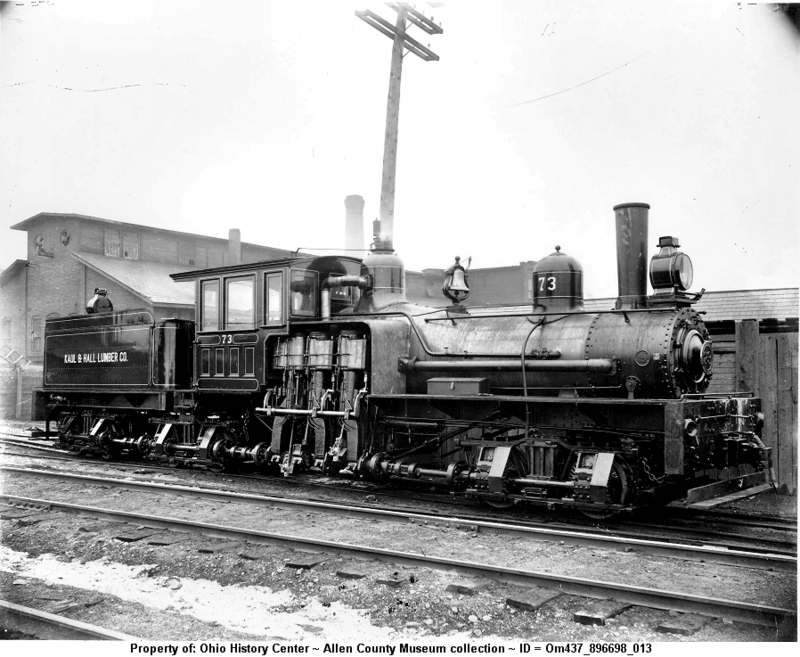 Built 04/21/1891 - 36" gauge - (2) 6" x 10" cylinders -10 tons - 2 trucks - named "Achilles"
The locomotive, owned by the Kane & Elk Railroad Co., operated near Kane, Pennsylvania. Built 02/05/1913 - Std. gauge - 18" x 20" cylinders - 48" drivers - 160 tons (286,700 lbs) - 3 trucks - maximum tractive effort 74,400 lbs. It was the heaviest Shay that Lima ever built. It also had the distinction of being the only one built with this cylinder size. 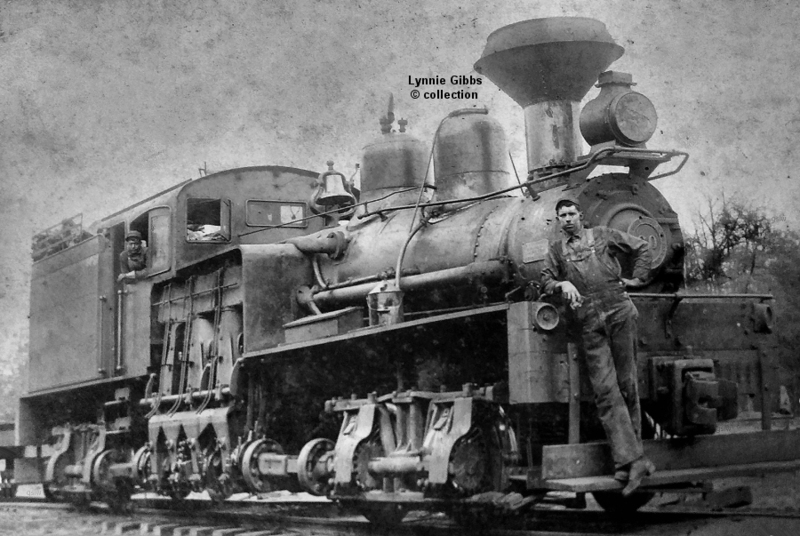 This image appeared in the November, 1915 issue of The Locomotive World periodical. 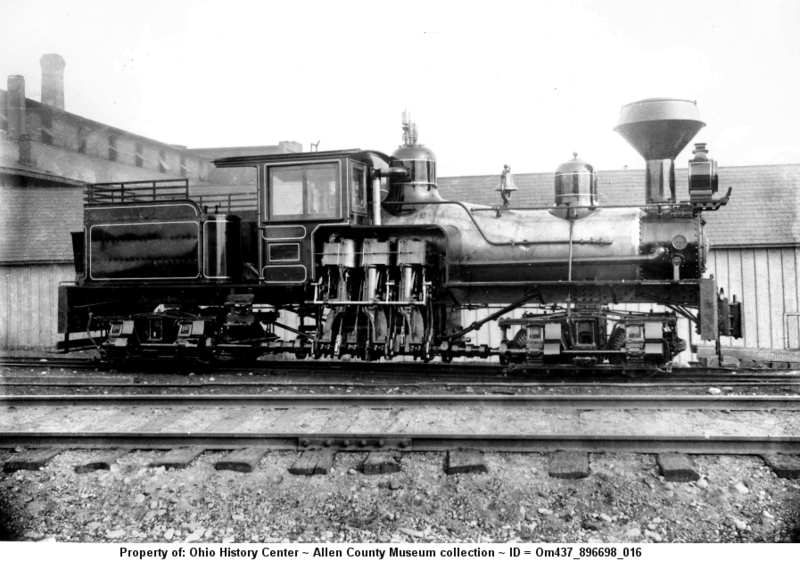 The locomotive operated on Kelley's Island, Ohio. 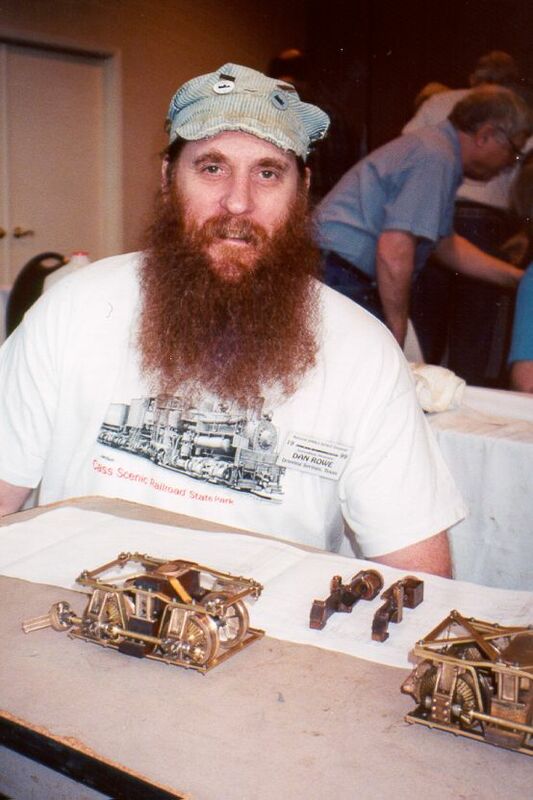 Of the 66 Shay's owned by the company, this was the only built to a standard gauge. The locomotive, named "WM. Chisholm Jr.", operated near Marblehead, Ohio. 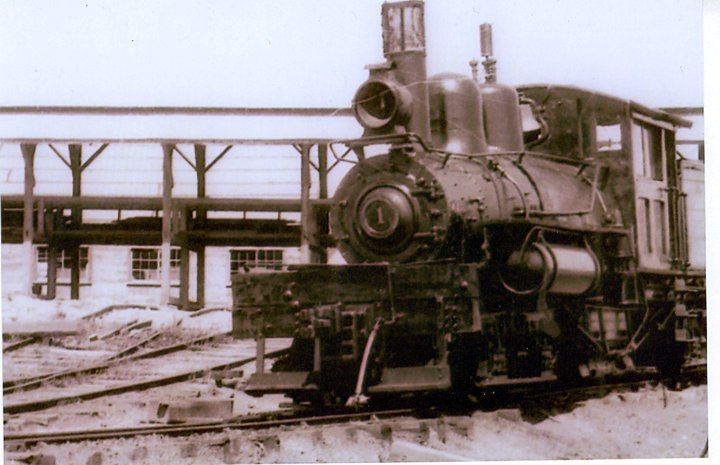 The locomotive, named W. A. Pardee, operated at the company's Kelley Island, Ohio location. The locomotive was named the "Geo. B. Morley"
The company name is misspelled in the lettering on the tender on this image of the builder's photograph. 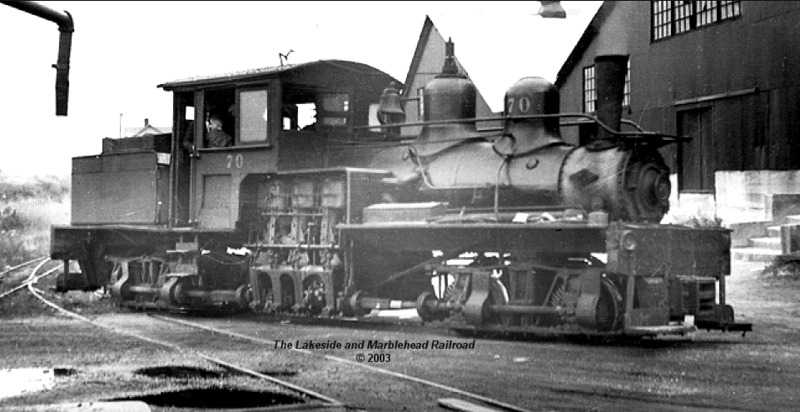 The locomotive operated near the company's Marblehead, Ohio location. Locomotives noted above in the same left to right order in which they are parked in the photo on July 3, 1938 at the company's roundhouse near Marblehead Ohio. The locomotive at extreme right in the photo is unidentified. It is interesting to note, the locomotives are still using "link and pin" coupling at this late a date. Also, none of the four had headlights or airbrake hoses (at least on the front). Photo Credit: Denver Public Library. In the library's text for this photo, they incorrectly note the left most locomotive (#71) as #21. 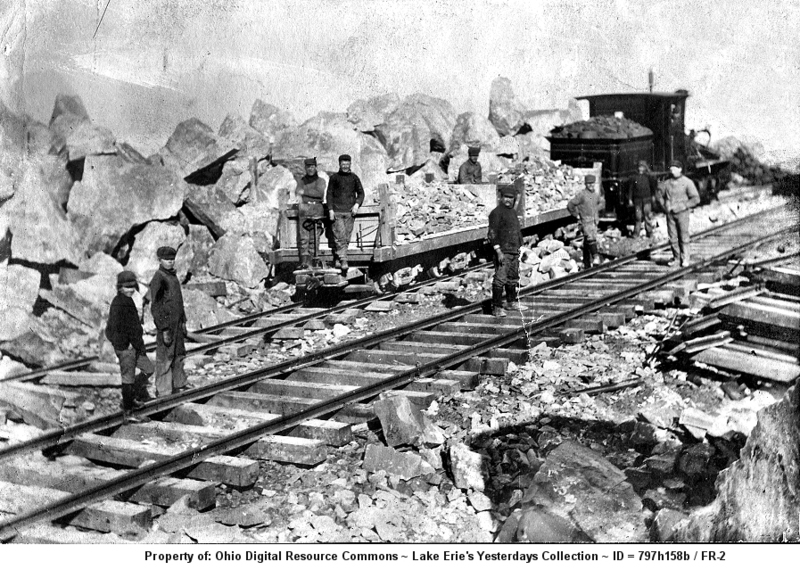 The locomotive operated near Marblehead, Ohio. The rear portion of Kelley Island Lime & Transport Co. #67 - s/n 2901 is seen at right in the photo. The photo was taken of the locomotive while on the Pennsylvania Railroad within the Manor Township of Lancaster County, Pennsylvania in 1905. The company was an equipment dealer. 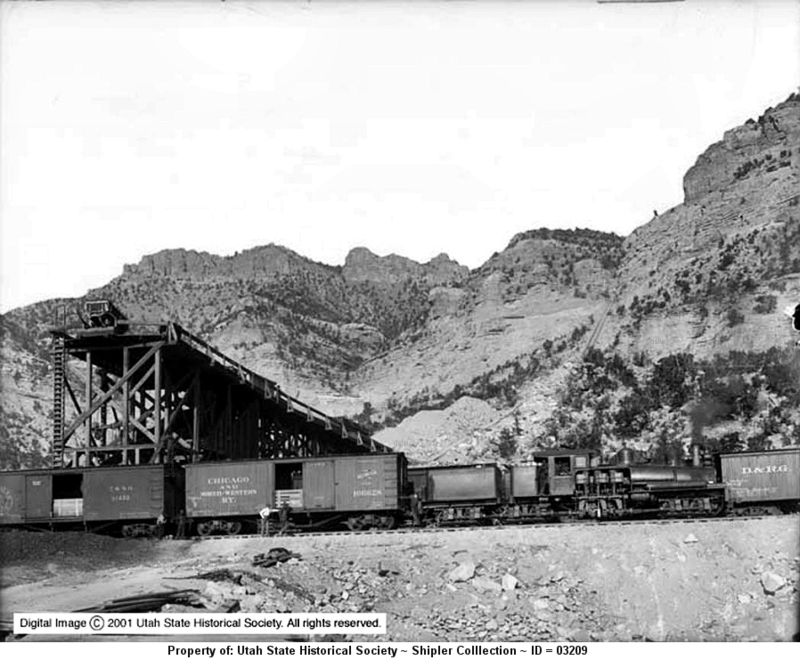 As pictured, the locomotive is lettered as "Six Companies, Inc. #5 , Boulder City, Nevada." 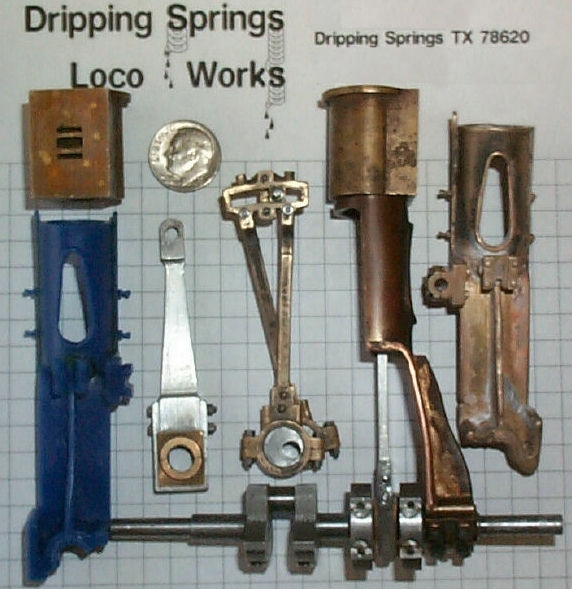 Six Companies rejected the locomotive before the sale was completed. Both photos hosted by Barry Cott of Station Studios. 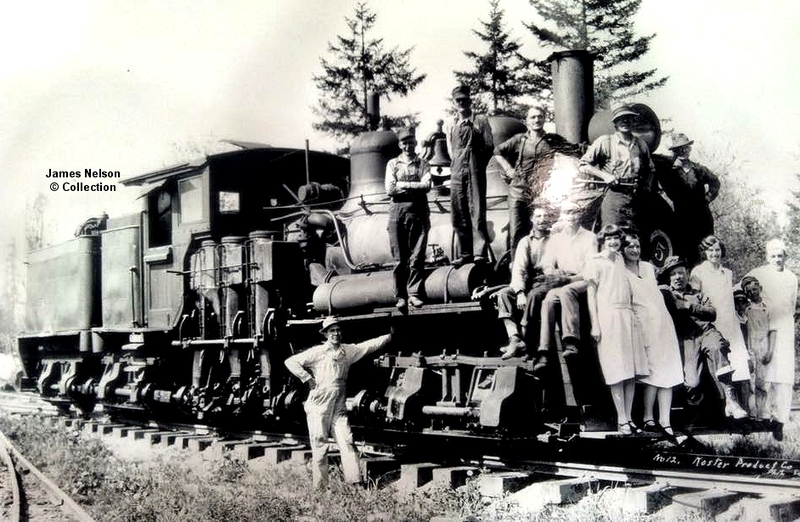 The locomotive operated near Kerry, Oregon. 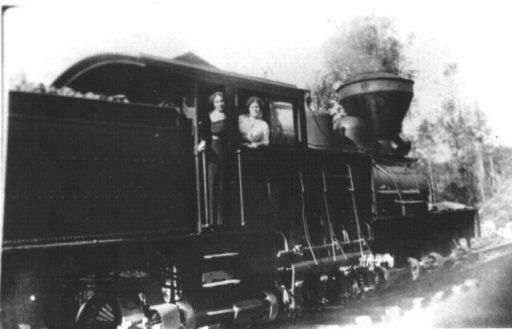 The locomotive operated near New Wood, Wisconsin. 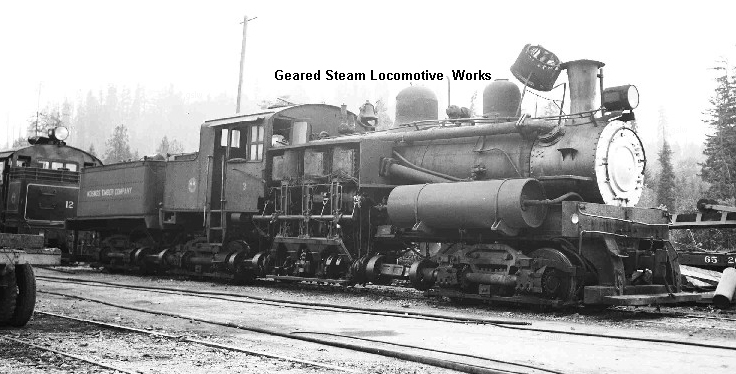 The locomotive operated on the company's Condon, Kinzua & Southern RR. The locomotive operated near Browndell, Texas. The photo is part of the Lynnie Gibbs collection. The company was owned by the St. Regis Paper Co. 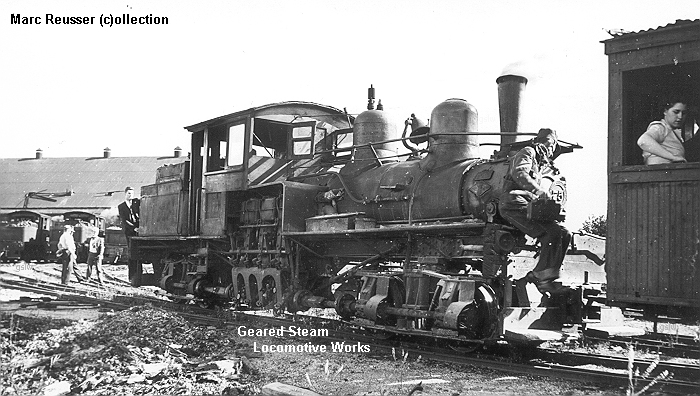 The locomotive operated near Astoria, Oregon. The photo is part of the James Nelson collection.